Las Vegas police are warning the owners of specific model Ford vehicles that have become hot targets for thieves. Mike Baker says he was a recent victim when thieves took his 2002 Ford F250 Super Duty from in front of his home. "It was a sinking feeling, like a part of me had been stolen, part of the family had been stolen," said Baker. Security video shows the theft occurred on Wednesday, Sept. 19, around 12:45 a.m. near Tropical Parkway and Losee Road in North Las Vegas. Baker says he walked outside his house on the way to work when he made the discovery. Baker immediately called police to report his truck stolen but he also went on the hunt. "I kind of drove around based on some personal research to see where other trucks like this had been stolen," said Baker. Baker used Facebook to network with others and he quickly found he was not the only recent victim. Folks online are self-reporting several similar thefts of Ford trucks and Suvs. 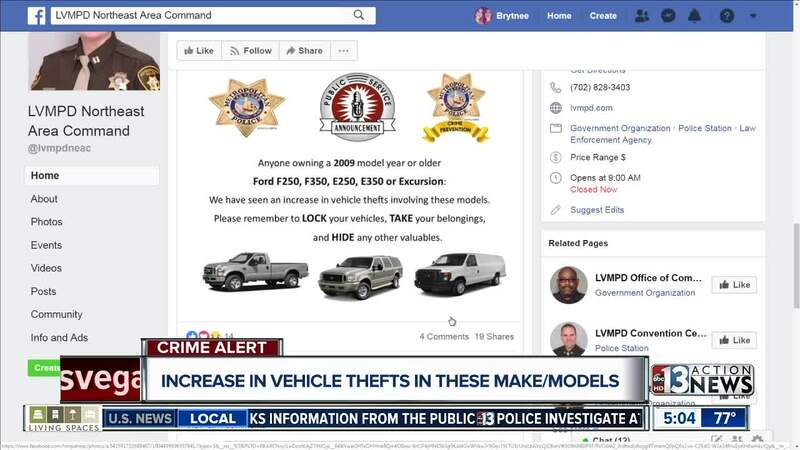 "Typically speaking, when you have a thief or a group of thieves that have learned to defeat the locking mechanism on certain types of vehicles, then we will start to see a trend of those vehicles in a specific area," said Las Vegas Metropolitan Police Officer Larry Hadfield. Las Vegas police say the sheer number of Ford vehicles on roadways makes for a "target rich" environment. 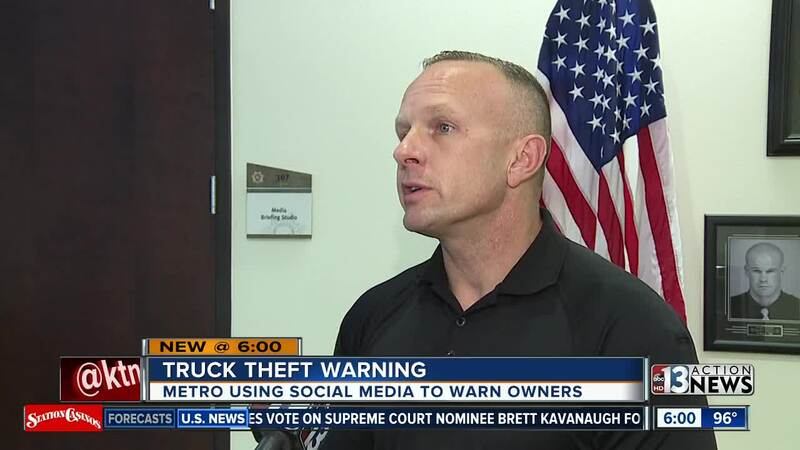 Las Vegas police were unable to say how many additional Ford vehicles thefts have occurred that led to the new warning. Police did not reveal additional details how thieves were able to gain access to the vehicles, how they were able to start them, or what they intended to do with the vehicles once they were stolen. "Sometimes it is to sell, sometimes it is to chop it," said Officer Hadfield. According to the National Insurance Crime Bureau , Ford trucks and SUVs model years 2000-2006 are commonly stolen because the vehicle keys do not have a security chip needed to start the vehicle. As for Baker, he says his vehicle was found a short time later with some damage and personal items stolen.